Bits of sarcasm and irony here but stands as a good reason for a junky info-break at the office. 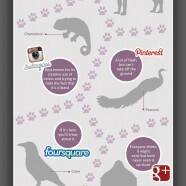 Take the major social networks to the animal kingdom. How would each one fit out in the wild?